WASHINGTON, D.C. -- The 20% job approval rating that Americans give Congress is essentially unchanged from June. 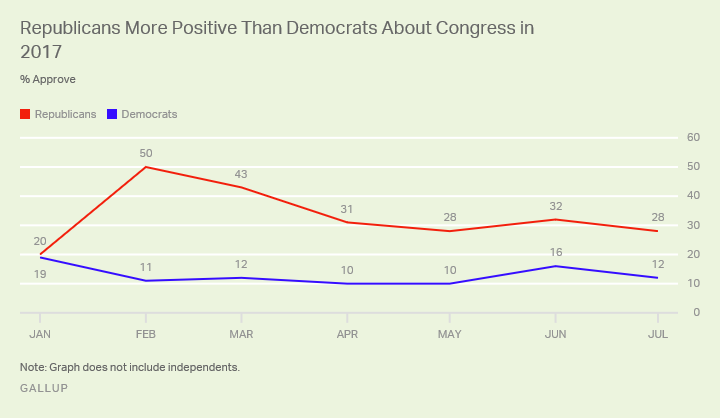 Approval of Congress has hovered near 20% since August 2016, apart from a brief bump to 28% in February after President Donald Trump's inauguration. 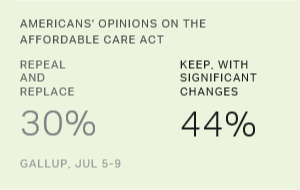 These data come from Gallup's July 5-9 survey, conducted after the U.S. Senate delayed a vote on legislation to repeal and replace the Affordable Care Act (ACA). February's approval rating of 28% is the highest it has been since 2009 -- when, like now, a newly inaugurated president (Barack Obama) worked with a Congress controlled by his party. The higher ratings of Congress seen earlier this year did not last long. By April 2017, 20% of Americans approved of the job Congress was doing. Approval was at this same level in early January before Trump took office. Congressional approval ratings during the early months of the Trump administration have been consistently lower than during the same period of Obama's presidency. 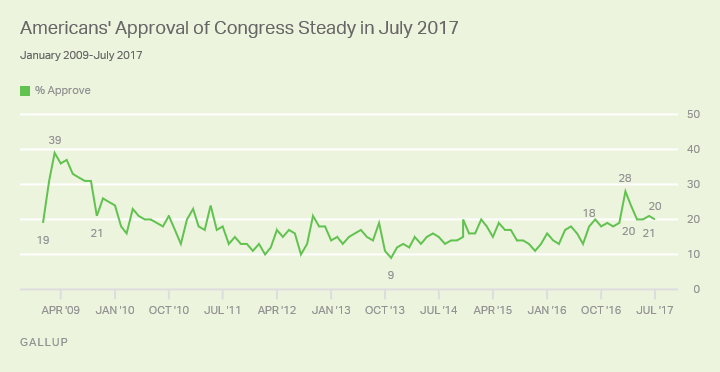 Americans' approval of Congress remained above 30% from February through September 2009, peaking at 39% in March of that year. Republicans continue to display relatively low levels of approval of Congress, despite controlling both houses of the institution. Twenty-eight percent of Republicans say they approve of the job Congress is doing, compared with 12% of Democrats. By comparison, during the two most recent periods in which Republicans controlled both houses of Congress (from 1995 to 2000 and 2003 to 2006), averages of 52% and 55% of GOP supporters approved of Congress, respectively. Republican approval shot from 20% in early January 2017 to 50% in February. But by April, GOP supporters' approval of Congress had fallen to 31%, and it has fluctuated between 28% and 32% since. Just before Trump's inauguration in January, 19% of Democrats said they approved of Congress. Since then, Democrats' ratings have fluctuated between 10% and 16%. Overall, Americans view Congress relatively poorly, with job approval ratings of the institution below 30% since October 2009. A different Gallup measure shows that a mere 12% of U.S. adults say they have confidence in Congress, the lowest rating of 14 major institutions that Gallup tracks. Substantial improvements in Americans' views of Congress are not likely to occur until the institution moves forward on its stalled efforts to repeal and replace the ACA, as well as other policies that Trump and Republicans have proposed. While successfully repealing the healthcare law may increase congressional approval among Republican supporters, it is unlikely to boost ratings among other Americans -- unless they have a positive reaction to Congress' merely managing to pass legislation.